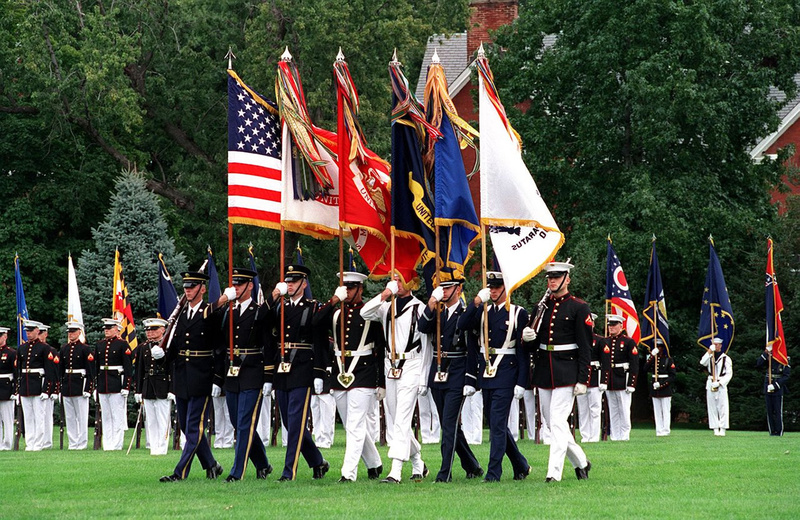 Are ceremonial parades important to you? Does your unit conduct parades where dignitaries, senior officers or members of the public attend? What Does Digital Parade™ Do For Me? With the flexibility of a live band, Digital Parade makes sure your next ceremonial engagement is perfect from start to finish. Digital Parade™ is the world's first live parade sequencer. With Digital Parade, you can control the playback of ceremonial music in real time, just like conducting a military band. 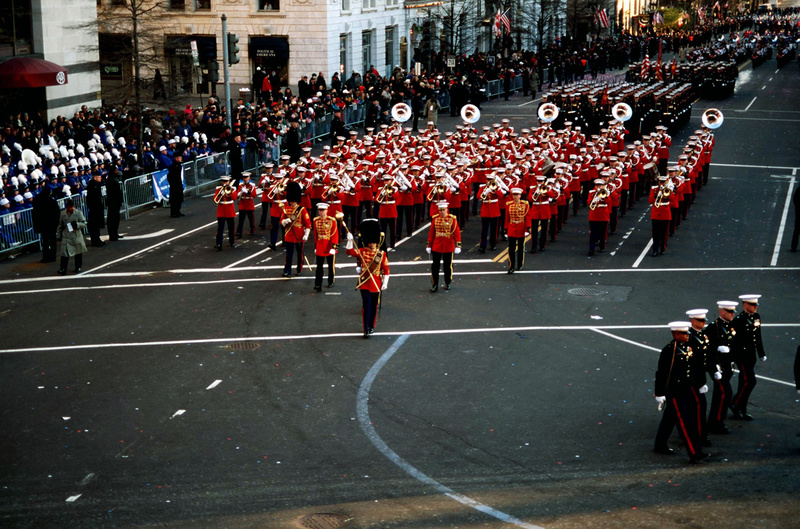 The system is designed by a former serviceman and engineer to allow military/JROTC/cadet units to mount ceremonial parades, reviews and services where it is not possible to have a live Service Band attend. If you do have a live band, Digital Parade can be used for practice and rehersals by marching personnel in preparation for marching with the real Band. Digital Parade comes in a number of editions — preloaded with music for your service (Army, Navy, Marine Corps, Air Force, Coast Guard, etc.) both for the United States and international armed forces. Of course, you can add your own music — simply insert a CD or select an MP3 file on your computer and Digital Parade will import the music, ready for use. Simple and intuitive to use, Digital Parade plugs into your Windows laptop via USB, where you use the Digital Parade software to control the music. You then connect the laptop to your speaker/P.A. system to hear the music. Most units, schools and colleges use either a CD or an iPod/phone with a playlist to play their ceremonial music. While this may work for a garage party, it is simply not good enough for a ceremonial parade where the music has to be perfect. It's difficult for the music operator to play, pause and quickly change between tens of different tracks, and too easy to accidentally play the wrong music at the wrong time. 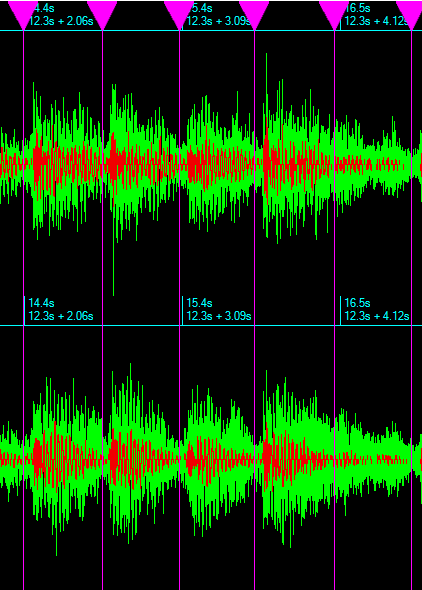 The gaps between tracks mean it is impossible to get movements such as big pass-in-reviews or changing from slow to quick time to work properly. Everyone ends up out of step and it looks like a disaster on the parade ground. CDs aren't flexible. Once you burn the CD, it is impossible to make changes. You can no longer respond to mistakes made by the parade commanders. Whatever is on the CD is what you are stuck with. iPods aren't any better — trying to change a playlist while troops are marching is a bad idea! Digital Parade™ is the only solution available for these problems. 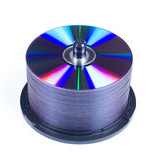 The system is also compatible (but not preloaded) with ceremonial music CDs produced by international bands such as the Ceremonial Music of the Australian Defence Force. If your service music is not yet available, a custom-produced edition of Digital Parade can be prepared especially for you. Digital Parade supports Windows XP, Vista, 7, 8, 8.1 and Windows 10. The device works on both tablets and laptops, although use of a mouse is recommended. Digital Parade shines when it comes to complex parades, memorial services and other ceremonial occasions. 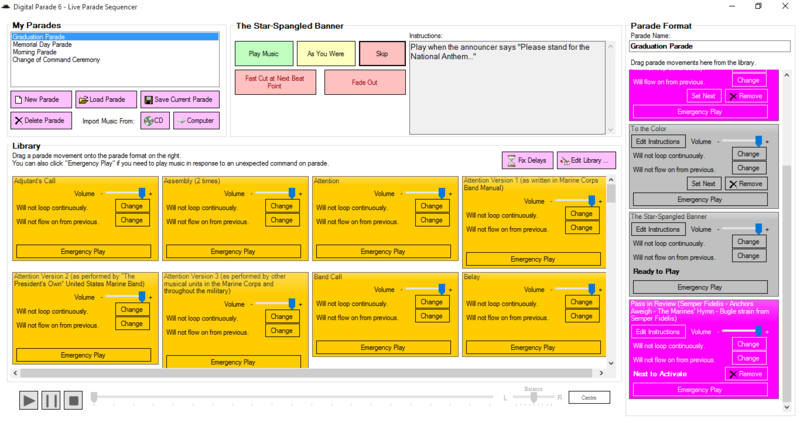 Digital Parade's innovative BeatPoints feature kicks in when you need to change between marches on a long review, change from slow to quick time, stop the music after troops have halted or stop a hymn at the right point in the music. When you tell Digital Parade to stop the music at the next beat point, Digital Parade will wait until the correct place in the music (as the foot comes to the ground for a march, or at the next verse of a hymn) before changing the track or stopping playback. This sounds professional, keeps everybody in step, and eliminates the need to press the button at exactly the right time. Alternatively, you can fade the music out over 5 seconds — perfect for drum rolls when dressing. You can even fine-tune BeatPoints to take into account delays caused by your computer, down to the thousandth of a second. BeatPoints is an advanced, innovative technology that takes experience in mounting large-scale ceremonial parades and brings it together with research into real-time computer systems, the brain's reaction time to stimulus, the physics of sound wave propagation on large parade grounds and other considerations to deliver a professional ceremonial experience. 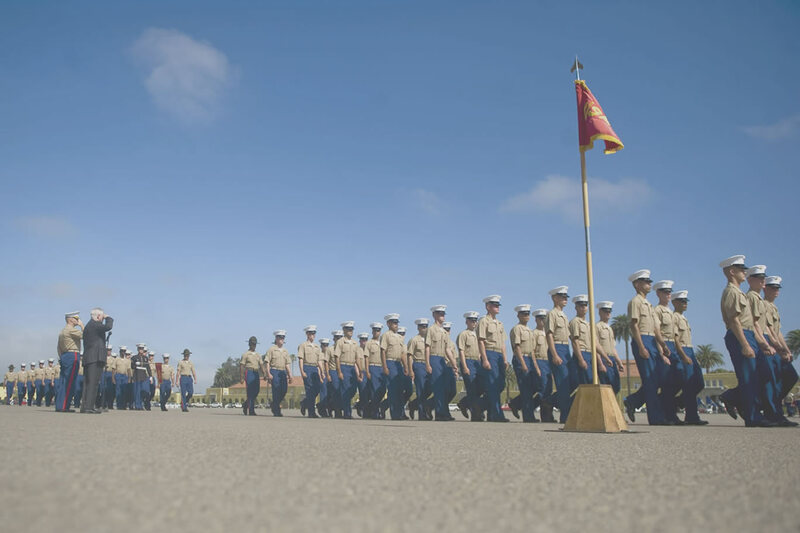 With Digital Parade, aspiring to perfection in drill and ceremonial is simple and intuitive. With a CD, the music is organized into tracks in a fixed order. Even the addition of an extra flourish or salute for a last-minute dignitary requires burning a new CD. With Digital Parade, you can add, remove and re-order movements, even while the parade is running and music is playing, by dragging and dropping items on the parade format. You can supply instructions to be shown to the music operator, so even a civilian with limited drill and ceremonial experience can operate the software. Digital Parade's "traffic light controls" (green to play, yellow for "as you were", and red to move to the next movement) couldn't be any easier to use, with large coloured buttons designed especially for using a laptop in the sun. Digital Parade has a strong focus on reacting to unexpected events on the parade ground, and covering mistakes made by parade commanders. Whether it is adding an extra salute or forgetting a dress, by playing the correct music, Digital Parade will make it look as though it was planned. 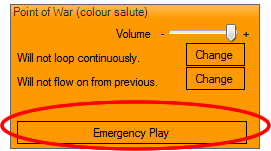 To respond to an extra command, Digital Parade has an "Emergency Play" button for each piece of music. After the music has finished, the parade resumes from where you left off. 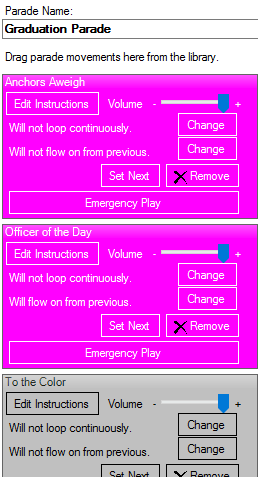 Digital Parade also allows you to skip music if the parade commander forgets a movement. Digital Parade clearly shows the next two movements that will play so that you are always in control. 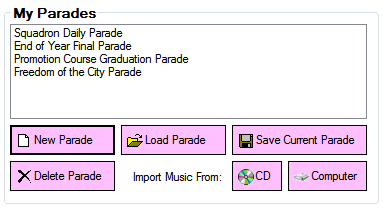 Digital Parade allows you to save and load parades. 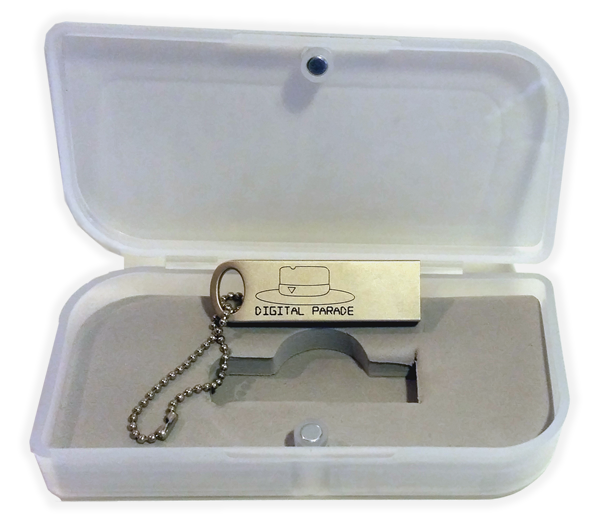 All data is saved on the Digital Parade device, not your computer, so there is no need to install anything, or worry about which laptop will be available on the day. Just plug it in and you're ready to go. 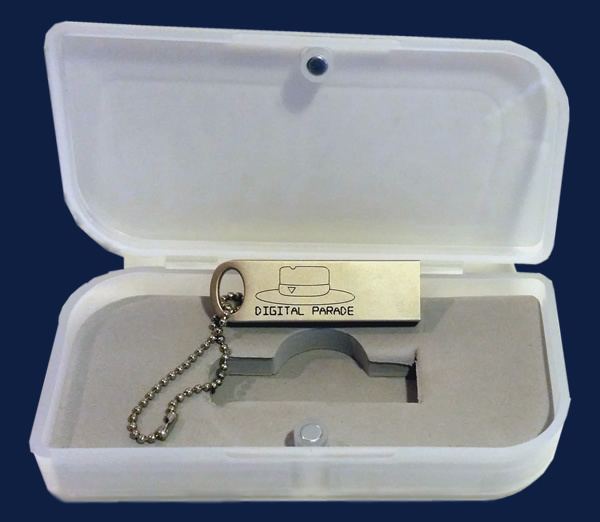 Manufactured by an American supplier, the Digital Parade device itself is durable and designed with no moving parts for maximum robustness. It comes in a protective carry case with foam insert to cushion against movement. Additionally, our hardware supplier is carbon-neutral, ISO 9001:2008 and ISO 14001 certified, and maintains a supplier code of conduct which mandates the human rights, dignity and lawful remuneration of workers. Digital Parade is available online right now through the Secure online shop. Alternatively you can Contact us for custom-produced editions and bulk discounts. We accept payment through credit card or PayPal. O'Neill Software Engineering (OSE) ABN 22 998 490 375 has sought and received written confirmation from "The President's Own" United States Marine Corps (USMC) Band, the United States Navy (USN) Band, the United States Air Force (USAF) Band and the United States Coast Guard (USCG) Band that each Band's respective music preloaded onto Digital Parade is in the public domain. The United States Army edition of Digital Parade is assembled from public domain recordings of the US Army Band. Neither the US Army, USMC, USN, USAF, USCG nor any other component of the Department of Defense has approved, endorsed, or authorized this product. O'Neill Software Engineering respects the copyright restrictions of the Australian Defence Force (ADF) and as such does not preload ADF ceremonial music on Digital Parade devices. Instead, Digital Parade knows how to recognise the approved Ceremonial Music of the ADF CD which an authorised member may import into Digital Parade. As with any other music file imported, it is the responsibility of the user to ensure they have proper approval to use the music. 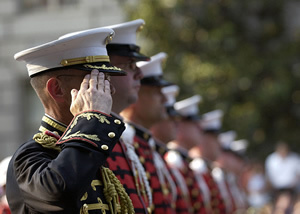 O'Neill Software Engineering uses the United States Marine Corps Band's national anthem collection for the Diplomatic Edition. OSE expressly disclaims any responsibilty as to the accuracy of the anthems contained therein, and customers are urged to verify that anthems are up to date by contacting the United States Marine Corps Band. Other musical pieces may be sourced from other public domain repositories such as Wikimedia Commons. O'Neill Software Engineering, the OSE logo, Digital Parade, the Digital Parade logo and BeatPoints are trademarks of O'Neill Software Engineering all rights reserved. Site content including video demos and screenshots are copyright O'Neill Software Engineering, all rights reserved. Other images used are public domain images unless otherwise indicated.